Cutting-edge design, functionality, expression and education result in an innovative community space. 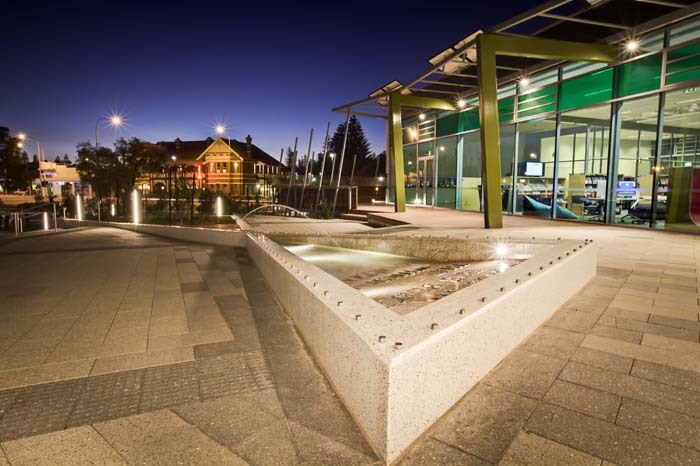 The Grove Library is a new precinct that contains a state-of-the-art library facility and community centre for the Shire of Peppermint Grove, Town of Mosman Park & Town of Cottesloe, as well as the administrative offices for the Shire of Peppermint Grove. The Newforms Design Team designed the landscape for the precinct. 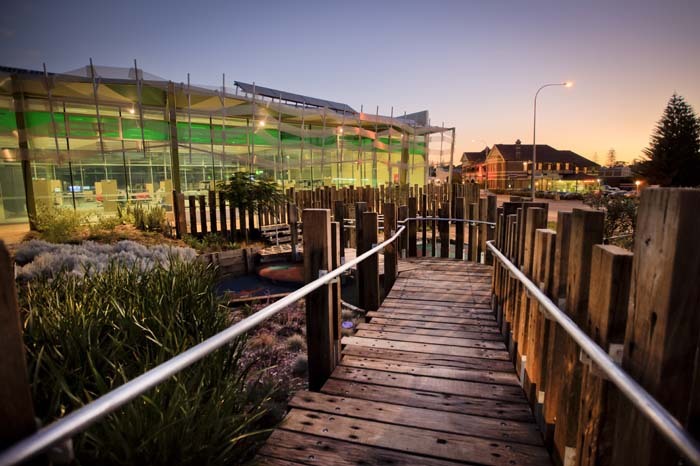 The whole library precinct was built by PS Structures with Phase3 Landscape Construction providing building services for the soft landscaping and special features such as the sensory playground, light cubes and water feature. The role of the landscape architect was very important for this project; lead landscape architect, Matt Huxtable, landscape architectural project director for Newforms Landscape Architecture, was directly involved in putting together his own sub-consultant team as well as actively working alongside and co-ordinating the team of sub-consultants. The project went beyond the brief and the client expectations. One of the key achievements for the Newforms team was getting the stakeholders onboard right from the start with embracing a low turf and predominately native plant palette for the landscape. 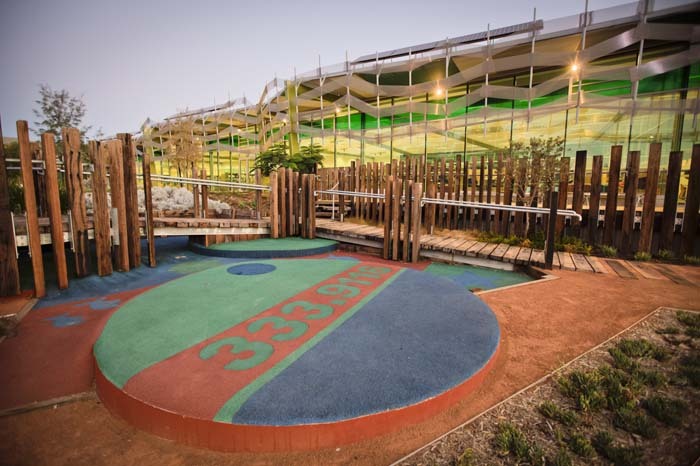 Newforms saw the project as an opportunity to demonstrate new ideas in what a Perth civic park setting could be. Newforms was keen to only have as much lawn as could be supported by the wastewater generated on-site. In this way the turf areas were broken into a number of areas (rather than one big one) to add interest and enable the native planting to juxtapose with the turf areas. The project demonstrates innovation by going beyond best practice through its integration of cutting-edge waste water reuse technologies in the landscape. The initiatives included: brown water separation, treatment and reuse; rainwater collection; and stormwater collection. The site is located at a low point of a major stormwater catchment area and the existing infrastructure was insufficient to deal with peak events. The civil engineering solution originally involved a massive subterranean soak well system that would have compromised the landscape by severely limiting trees and structure in the landscape. Newforms’ team designed an open sedge land basin that in storm events fills before the soak well system and subsides soon after. 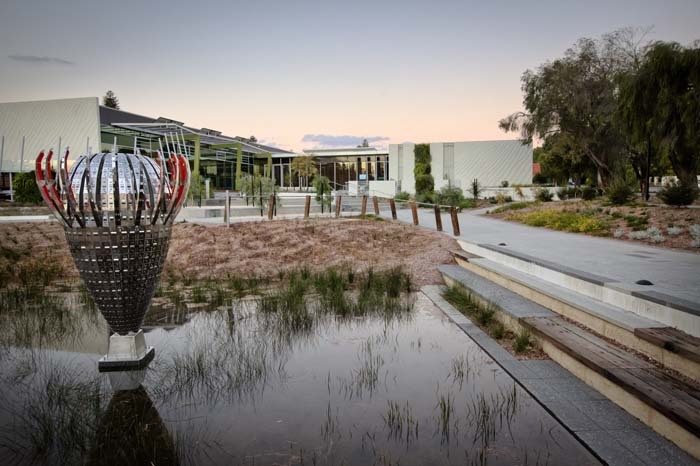 This plays out as a dynamic landscape feature which depicts the transient nature of water in the Perth landscape and provides an educational element. The appropriateness to function is apparent with the landscape providing a number of spaces for different users including quiet sitting areas, a children's sensory garden space and a robust civic space. Newforms Landscape Architecture, along with its partner company Phase3 Landscape Construction, offers a comprehensive service in the design and construction of high quality finished landscape projects. Phase3 Landscape Construction is a Perth-based landscape contracting company that offers a comprehensive service in all aspects of landscape construction. Newforms prides itself on creative, distinctive, intuitive and sustainable solutions to the design challenges presented by the unique conditions in contemporary urban and natural Australian environments.